So, as you may know, I've been blogging for Southern Living. This is thrilling, something I dreamed of when I was little. Well, not blogging exactly since that wasn't a thing, but here we are. My mom would be so proud. Her mother's Winnsboro yard was once on the cover of Southern Living, though my mom herself didn't make it into the shot. The little girl in the enormous patch of jonquils, the same patch where we used to hunt Easter eggs, is a friend of my mom's. Lavinia, maybe? Perhaps one of my Winnsboro readers will remember and let me know. The cover would be from the early- to mid-fifties and I wonder if I could get a copy. But I digress. One of the best things about blogging for Southern Living is I'm forced to develop at least one recipe a month. Some of us don't really do intrinsic motivation and need assignments. Any freelancer will tell you how hard it is to be the boss of yourself, especially when you have other bosses who are more demanding. But here we are! This month, Southern Living wanted to know our best Thanksgiving recipes and I was at a loss. Every writer wants to be original but how can you improve on the classics? And who wants some new-fangled trash on a gosh-darned national holiday? I'll tell you really didn't. One year, on the cusp of adulthood, I was asked to bring sweet potatoes to Thanksgiving. Please don't hate me but I hate them, at least, the way they're made for holiday meals. Fact: Marshmallows should not be paired with anything other than hot chocolate or s'mores. I told Mom I was bringing some sort of nonsense like twice-baked sweet potatoes with cilantro crème fraîche. Her response? "WHY CAN'T YOU JUST BRING THE NORMAL SWEET POTATOES? WHY DOES EVERYTHING HAVE TO BE SO HARD?" Exactly. Why does everything have to be so hard? There are plenty of things that are miserable and difficult all on their own so why not JUST MAKE THE NORMAL SWEET POTATOES? I did, and they were just fine. There is definitely a normal version of pineapple casserole, or pineapple gratin, as it's sometimes called. And the NORMAL PINEAPPLE CASSEROLE is wonderful, but I had to meddle just a little. Then I had to meddle a little bit more. And that's why I made individual bacon cups full of pineapple casserole, and you should, too. Meddlesome cooking doesn't need to happen every day, because your life is not a damn Pinterest board, but it can be fun every now and then. You'll mix the pineapple, flour, sugar and cheddar in the normal way. You'll stir together breadcrumbs and melted butter, like you do anytime you make a holiday dish requiring a crumbly topping. And this is where it gets weird. Punch out some bread circles and par-cook some bacon. Let the bacon cool or risk burning the crud out of your fingers. Now wrap a piece of partially cooked bacon around the edge of each muffin cup. Fun Fact: The first time I made this I used the bottoms of some Lizard's Thicket corn muffins for the base and they were delicious. Now go back to the normal way of making pineapple gratin and fill each cup with your pineapple mixture, then top with breadcrumbs. Now cook it and you'll end up with a plate full of individual bacon cups full of pineapple gratin casserole. And people will love you. Isn't that nice? Begin by par-cooking bacon on a sheet pan in the oven. Cook at 400° for about five minutes, ensuring bacon is still somewhat pliable. Remove grease by laying the bacon on paper towels. Place one bread circle in the bottom of each cup of a 12-cup, non-stick muffin tin. When bacon is cool enough to touch, line the sides of each cup with one slice. Mix chopped pineapple, flour, sugar, and cheese. Fill each cup with mixture. 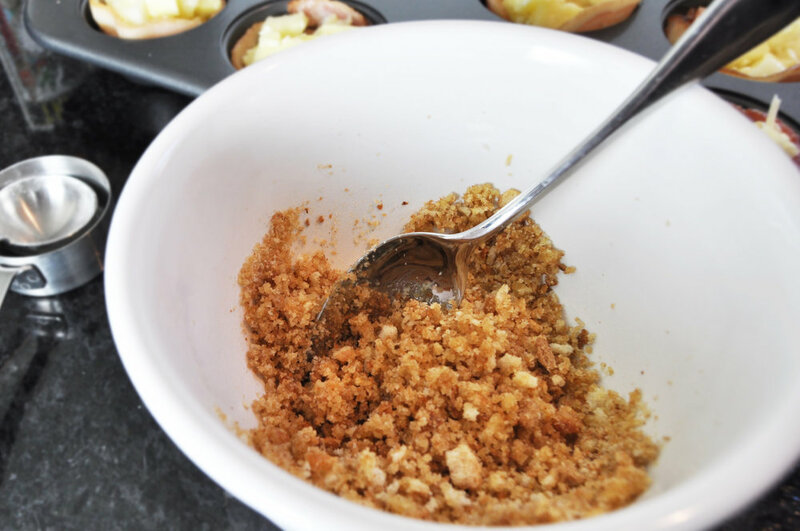 Mix bread crumbs with melted butter and top each cup with crumb mixture. Bake at 375° for 20-25 minutes, covering with tinfoil if breadcrumb topping is getting too brown for your taste. Let cool slightly before removing from tin and serving. If you need to reheat the cups when you arrive at your destination, cover with tinfoil and heat in a 350° oven for ten minutes or so. If you're transporting for a potluck or any other random reason, transport in the muffin tins, if possible. Is this a little more complicated than just straight-up pineapple and cheese casserole? Of course it is, and y'all know I generally try to save you time, not make life harder. But just this once, let's get a little bit meddlesome in the kitchen. I mean, last Easter, one of our guests brought Jell-O shots, in the shape of deviled eggs and petits fours. (This is the same woman who one brought lamb-shaped butter to Easter because I'd forgotten to order it. And she put little tiny glasses on each lamb, so it was hipster butter. Yes, she's permanently on the guest list, for every party we ever have until the end of time.) I'm not asking you to make pineapple gratin in the shape of a turkey. This seems like the least we can do! Speaking of things that are easy, I just started writing a column for Columbia Living, that will also be printed in Charleston Living and Wilmington Magazine. It's called "Perfectly Capable," because I believe in you and know that you're perfectly capable of doing any number of things that Pinterest has made super-complicated. Here's the first one, "How to Host a Dinner Party, Any Night of the Week." It absolutely does not involve creative Jell-O shots or individual servings of anything. Promise!